If you’re old enough, you may recall a time when movies were made, released, enjoyed, and that was it. Yes youngins’, believe it or not there was a time where not every film spurred a sequel or jump-started a franchise. For better or worse those days are gone, and as The Hollywood Reporter predicts, this year will be the year of the “shared universe.” No longer satisfied with million dollar earning franchises, Hollywood is looking to link even more films together, turning millions into billions at the box office. Basically, it’s “Marvel envy,” plain and simple. Theirs is the blueprint every studio is hoping to emulate. Beginning with Iron Man in 2008 through to the billion dollar earning Avengers, Marvel has dominated the box office. How are other studios to compete? By manufacturing their own multi-film-spanning universes. First up, THR points to Sony‘s recent hiring of five writers – Alex Kurtzman, Roberto Orci, Jeff Pinkner, Ed Solomon and Drew Goddard – to craft their shared Spider-Man universe. Since Spidey’s the only major superhero Sony has their entire universe must revolve around him and his villains. Luckily, their rebooted Amazing Spider-Man franchise is off to a strong start, but are characters like Venom and the Sinister Six enough to support a whole string of films? That’s certainly debatable. FOX has a similar problem, but thankfully for them they’ve got a whole stable of popular, familiar – and most importantly – bankable characters in the X-Men. Already FOX has seen success with their X-Men films, having overall more hits than busts. And with the upcoming X-Men: Days of Future Past linking their two generations of mutants, the potential for even more X-films is increased. On top of the X-Men, Simon Kinberg is working to bring the Fantastic Four into the fold as well, giving FOX a shared universe of superheroes that could possibly rival Disney and Marvel. Bringing up the rear is Warner Bros.’ and their DC properties. Desperately playing catch up, the Man of Steel sequel, Batman vs. Superman, is to be the starting point for their own shared universe. Sure, you could argue they’re behind the pack because of their extremely successful Dark Knight trilogy – and you’d be right – but this does find them having to introduce a lot of characters very quickly. All in one movie, it seems. 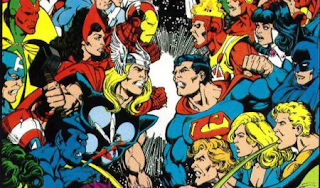 On the non-superhero side of things, Universal and Lucasfilm are also playing the shared universe game. All right, the Disney-owned Lucasfilm was already operating under the shared universe model, but with more films planned, like spinoffs that won’t follow the episodic formula of the Star Wars films, their galaxy is only growing. And where other companies have superheroes and sci-fi legends, Universal has monsters. Beginning with a new Mummy reboot from Kurtzman and Orci a whole new shared universe of classic Hollywood monsters is on its way – Dracula, the Wolf-Man, Frankenstein’s Monster, the Invisible Man, the Creature from the Black Lagoon, all of them. Sooner than later I’m expecting a shared universe of Jane Austen films where Elizabeth and Jane Bennet team up with Emma Woodhouse to find true love for Fanny Price or something. 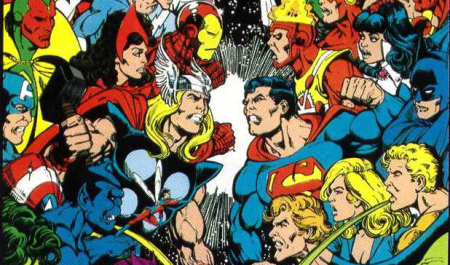 Are you ready for the onslaught of “shared universes”? Which do you believe will be most successful?